Posted by Celia Fenn, StarChildGlobal 8/6/15. 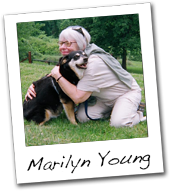 Marilyn Jean Young is, quite simply put, an animal lover who believes our consciousness is intertwined. In fact, she believes the consciousness of all matter – organic and inorganic – is intertwined. A photographer with an eye toward connections, she’s received artistic grants to teach her photography/creative writing workshop “Seeing with Fingers, Writing with Eyes” which explores the interrelatedness of all things. It has been offered in after-school programs, summer camps, senior centers, and inter-generational programs. A career as a media writer/producer of educational, informational, and training materials for the K-12, medical, corporate, and legal markets took her across America, as well as to international shores. Teaching media production and design at the college level, and developing programs for inner-city middle and high school students, brought great fulfilment. But the most rewarding enlightening moments – of utmost joy – have been with her rescue dogs – Hilda and Reba. Their soul wisdom has taught her that the most effective change comes with patience, respect, love and compassion – one connection at a time.